We have been living in a motorhome for 12 years now. This is our third motorhome with a washer-dryer combo. The first one we had was not vented outside. We didn't know much about these machines, but we soon learned that this type of machine takes a long time to dry, sometimes three hours. It was quite frustrating! The next machine we had was vented to the outside, so it dried clothes in less time, maybe two hours for a large load. But the drum was not that large and you couldn't put a lot into it. We now have our current machine and really love it. It is so much more modern and the dials allow you to choose what you need, such as permanent press with a low, delicate cycle. This is really helpful if you are washing fragile things and don't want them to get all messed up. 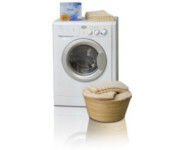 A low spin cycle is also available so that you don't wrinkle up all those clothes. There is also a prewash cycle for the really dirty clothes that you have. Just like on a machine that you would have in your house, not just a motorhome. An extra rinse is an option as well. I just love all the choices I have when I wash clothes. The dryer dries in about an hour and a half to two hours for towels and heavy articles. The capacity of this machine is much larger than the others so that you can put more in at one time. For delicates, they dry in about an hour. The machine is quiet and really functions as well as the machines you buy for your house. There are five heavy duty cycles, five permanent press cycles and three delicate cycles. You have a choice for anything you need to launder. Another good point about this machine is that if you need to stop the dryer and take something out before the cycle is done, you can press the on/off button and it will stop and allow you to open the door. This was not available on the previous newer machines. If you press the start button and hold it in, it allows you to stop the cycle completely. I am extremely happy with my Splendide 2100XC and would recommend it to anyone considering buying a washer-dryer combo. The on-line world might be bogged downwards with the help of counterfeit web logs without a proper personal message nonetheless put up was basically awesome not to mention value typically the read through. Regards for the purpose of showing this unique when camping. Your product is very wonderful. I am sharing this great on Reddit and other high quality sites . Keep it up! Lint is a Big Problem! I am going to give that a try and if it doesn't work, I am removing the darned thing and out it goes! At any rate, if you are having the problem with overheating and lint build up, you might try the workaround. Just bought a new unit. It works perfectly, but had a problem with the door not opening when the Dry cycle finished unless you pushed and held the Start button to cancel the program. The factory couldn't have been more helpful, however, mystery to all, it suddenly worked OK after about 15 cycles. In the meantime the factory had provided new parts under the warranty, but as they weren't needed, I sent them back. Re drying time. This is often mentioned as a problem. The solution is to install an inline booster fan in the vent tube. I made my own from a 4" computer fan that I sandwiched between two pieces of plywood, each with a 4" hole cut in it. I got two vent hose connectors from Home Depot and mounted them each side and installed the unit about half way along the run. My hose run is about 12 feet, by the way. My drying time with is full load is one hour. The key is the speeded up airflow through the machine which pulls the moisture out faster. You can connect the fan, which is 12V through an on/off switch. We purchased this washer dryer combo for our RV in 2009. Have had not but problems with it ever since. Often does not dry a small load in two or three hours. Someimtes won't spin. I made many tech service calls in 2009, my husband is very savvy with mechanicals. Each time they would tell us something else to try. We would take it apart to whatever extent they suggested and go through the motions. Might work ok for one or two laods and then same old story. Finally, the techs told us to haul it to IN. We do not live close enough to do that. Husband had some health problems in 2010, so we were not full-timing agin that year. Now we are, and it's the same old story. Many, many tech calls, many many disassemblies/reassemblies,once in a while after one of these it will do literally 2 or 3 lods ok, then back to same ole stuff. Obivously a lemon. Cannot get any satisfaction from the manufacturer other than further things to try. My husband still works, we are tired of him having to work on this expensive appliance in much of his leisure time. Obviously, we have gotten a lemon, we purchased it right after the model cme out. I often find myself at the laundromat, after spending over $1200 on this piece of junk. Company not standing behind this product enough in our book.